TIME: 2 min. 20 sec. 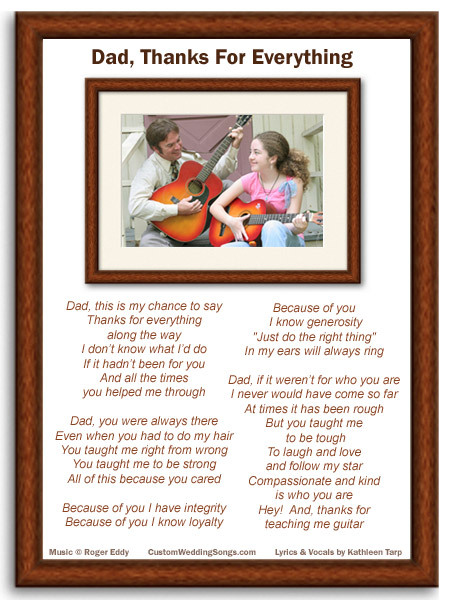 About this sample song: The sample lyrics Dad, Thanks For Everything were written as a surprise tribute from the bride to her father for the Rehearsal Dinner and it was also played at the reception for the Father/Daughter dance. The music is Song # RE003. LISTEN WITH FLASH (Requires Flash Player 7 or higher): Click on selection to hear full song.